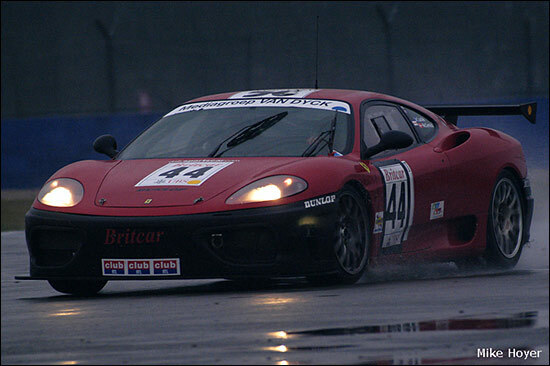 A rainy Silverstone has produced some of the most exciting endurance races of recent years, and on Saturday, in the 110-minute Britcar race on the International circuit, Calum Lockie took a magnificent win in Bo McCormick’s Ferrari 360, after the Swede unselfishly vacated the car early in the tricky conditions. Race returnee Adrian Slater, old hand David Leslie, and the vastly talented Mark Cole were also notable for stunning performances. Friday testing had seen the demise of Steve Hirst’s Opel Astra DTM, Bill Cameron’s Porsche (engine), and the Damax Ferrari 360 of the young Cole brothers, which had a massive accident, but nevertheless, 19 top quality entries took to the track on Saturday morning for the dry, 30 minute qualifying session. Richard Chamberlain’s Porsche 935 “replica”, which has trounced all opposition in the Porsche Open championship in the last few years, took pole with 1:25.273, which was only half a second quicker than Mark Sumpter’s time in Adrian Slater’s Porsche GT3R. Slater, returning to racing after a three-year sabbatical, has bought the ex-Mike Jordan BGT car, and the Eurotech team were running the car for him. Calum Lockie signalled notice of intent by placing the Ferrari third, a second down, and the RPM Porsche GT3 of young charger Alex Mortimer and newcomer Chris Panayiotu was fourth, a further four-tenths shy. “We plan to do the whole series, and get as much track time for Chris,” enthused Alex. Well down in the mix was the GTS Motorsport BMW M3 of Harry Handkammer and David Leslie, languishing in a midfield ninth grid slot. “We had an engine blow-up in testing last week, and we’ve cobbled up a make-do-and-mend unit to get us through this weekend,” explained team boss Tom Shephard. 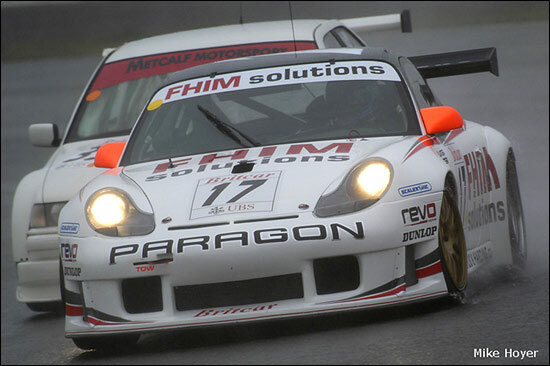 Even further back was the 911virgin.com Porsche of Henry Firman and Pete Morris, encountering suspension problems. Rain had been falling intermittently since lunchtime – a squally, nuisance rain – and the field was given two pace laps before the safety car peeled in to let them go for the rolling start. Chamberlain was first into Copse, but Eugene O’Brien had poked the nose of Peter Seldon’s BMW GTR through some just-about gaps, and was into second place. 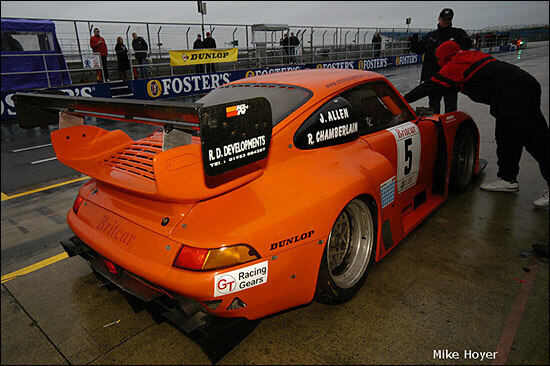 As they crossed the line for the first time, the orange Porsche had a four-second advantage over the fleeting O’Brien, followed by the Porsches of Sumpter and Mortimer, the fast-starting BMW of Mark Cole, Handkammer’s similar machine, and Sean McInerney’s Mardi Gras Porsche. Bo McCormick came past in 12th place, and would not improve as his stint unfolded. 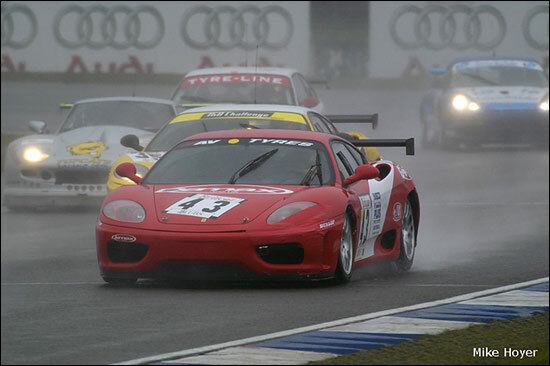 Terry Coleman brought his Damax-run #43 Ferrari 360 straight into the pits to clear a misted-up screen. “I told him that a stop wouldn’t be the end of the world in a race like this, and he had to be comfortable,” said driving partner Ian Flux. As Chamberlain powered into the distance, the early laps were notable for the third place battle, Sumpter, Cole, and Mortimer circulating as one. Mortimer in #96 eventually got the better of Sumpter, whilst Cole, an unknown quantity in the newly-built BMW, broke loose and began a short pursuit of O’Brien. Short, because the blue GTR was pitbound very soon, sounding rough. Eugene did a few more exploratory laps, but the day was over for him and Seldon. Oliver Morley brought the JMH Ferrari in early too, to fix a windscreen wiper. Another early casualty was Sean McInerney, still finding his feet in the Porsche, who was recovered from an excursion into the gravel, but went little further after a pit visit. With a 17-second lead, Chamberlain relaxed his pace a little, allowing Cole, and the even faster Mortimer, to play catch-up. His response was the fastest lap of the race, 1:35.239, showing them who was boss. With just 14 laps on the board, and a little under an hour and a half to go, McCormick brought his Ferrari in for the mandatory stop, and to hand over to Lockie. “I spun at Copse, and lost confidence,” he confessed, finding the wintry conditions a different deal to the heat and bumps of Sebring a week earlier. Race-shaping issues began to unfold at this point, 20 laps in, and just over an hour to go. Lockie was soon up to speed, rapidly becoming the fastest car on the track, but there was trouble for Mark Cole, the BMW receiving the black and orange flag because of an oil leak. Cole brought the car in after the third and final warning, and drove straight into the garage, leaving an oil trail mixing with the pit-lane puddles, like the backdrop to an early Pink Floyd concert. Race over for the Metcalf Motorsport team. 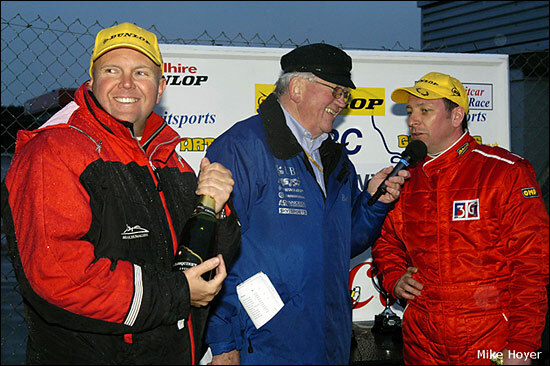 Mark Smith never got to drive, but Cole, a major protagonist in the Carrera Cup, had proved a dark horse, suggesting this could be a winning car in the right conditions. But why didn’t he come in at the first showing of the warning flag? “I didn’t know I was number 33,” he explained. Chamberlain brought the Porsche in for the first of two planned stops, handing over to the less-experienced John Allen. Terry Coleman’s Ferrari, and the BMW GTR look-alike of Philip Hopkins, scurried into the pits together, the BMW having made contact with the rear end of the Maranello machine. Fluxie was soon installed after some cosmetic work to the back of the Ferrari, but the Simpson team needed a little more work to get the BMW race-safe for Tony Rodriguez. 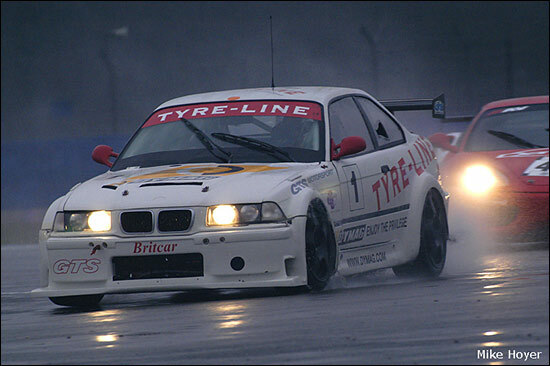 Ian White had beached the yellow Butler Motorsport BMW M3 at Abbey, and with an hour to go, and a smidgeon over half-distance, the Safety Car was deployed, wholly convenient for just about everybody to take their mandatory pit stops. Six laps later, after a prolonged wave-past to allow the leader to head the train, the field was let loose once more, the leader now being Adrian Slater, having relieved Sumpter in the Eurotech Porsche. Allen held second, followed by Henry Firman’s 911, having been hauled up the order in the first half of the race in typical bull-necked uncompromising style by burly midlander Pete Morris. 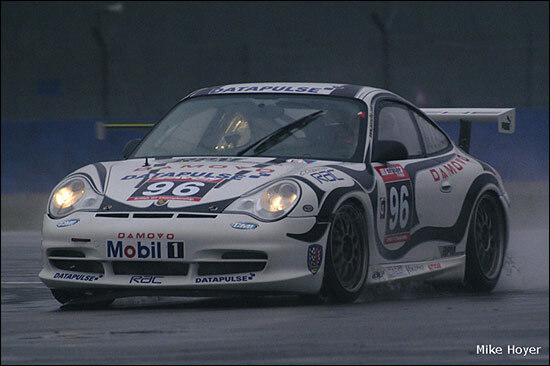 Newcomer Chris Panayiotu held fourth in the RPM Porsche, then Lockie and Leslie, both a lap down. Leslie had taken over the GTS Motorsport #1 BMW from Harry Handkammer, who had an atypically low-key first stint. “It was tough out there, and I kept getting spinners in front of me,” was his reasoning. Lockie wasted no time in unlapping himself, and Leslie employed much the same philosophy, a little further back on the track, and, all things being equal, a podium for both, or better, wasn’t an outrageous consideration - though Lockie’s exploration of the limits of adhesion in the greasy conditions would have been a major cause for concern were it a less experienced pilot. Touring Car collector Martin Johnston lost his ex-Rouse DTM Mercedes across the start / finish line, spinning and kissing the pit wall, necessitating recovery, and another outing for the Safety Car. Allen handed the big Porsche back to Chamberlain at this point, and once the field went green again, with less than 30 minutes to run, it was still Slater leading, ten seconds in front of Firman, with Panayiotu third, and Lockie fourth, 37 seconds off the lead, but a clear eight seconds (!) per lap faster than those in front of him. Lockie encountered little resistance, and with 10 minutes to go had a lead of three seconds, which would increase to over 35 seconds once the chequered flag brought a halt to the race, in the gathering gloom, after 59 laps. Slater brought the Eurotech Porsche home second, comfortably ahead of Leslie, who seized the GTC class win from Firman on the penultimate lap. Richard Chamberlain, the sole runner in the GTRS class, and another on a late charge, stole fifth from Panayiotu a few laps from the end, and Oliver Morley’s solo effort in the yellow JMH Ferrari bagged seventh. Fluxie pulled out all the stops to bring Coleman’s Damax Ferrari, a car that effectively started the race a lap adrift, home eighth. 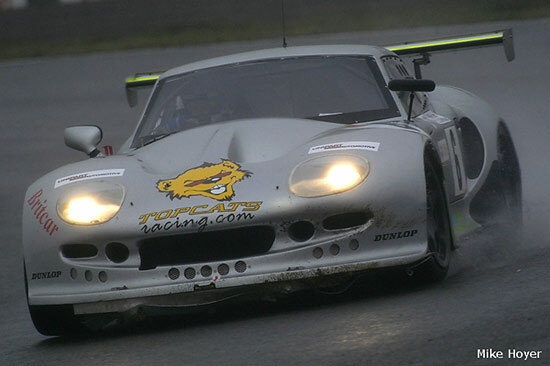 It was a quiet day for the Topcats team, the conditions perhaps not suiting the Marcos power, but Mick Mercer and Richard Fores were ninth, bagging third in the GTC class, and the sister machine of Jon Harrison and the peripatetic guest driver Jeff Wyatt was eleventh. The silver cars were split by the Damax Ferrari of Davids Back and Foster. Motorsport video supremo Peter Duke, sharing his BMW M3 with Adrian Watt, was 12th, in front of East Anglian businessmen Kevin Hancock and Leigh Smart, in the Team Jemco Marcos Mantis, and the classified runners were completed by the BMWs of Tony Brown / Ian White, and Tony Rodriguez / Philip Hopkins. A delighted Calum Lockie and Bo McCormick accepted their trophies from James Tucker. “It was scary out there, but it came our way,” said Calum, adding, “unlike others, Bo kept the car in one piece, and it was a brave decision of his to come in early. I gave it everything I could, and twice got into 45 degree slides at Becketts.” Brian Jones does the interviewing, below. 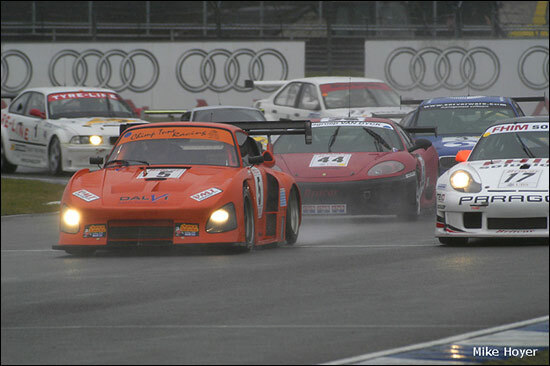 Just a fortnight to the next Britcar race, on Oulton Park’s full circuit, on April 8.